Pelton Wheel is the common example of Impulse Turbine. This turbine is developed by L.A.Pelton. 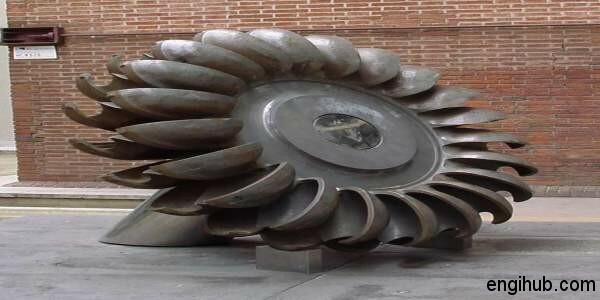 Pelton Wheel Turbine is used for high water head and low discharge. Turbines are the modern machines used to generate electricity from a renewable energy source in power plant. Hence in Hydro-Electric Power Plant Impulse Turbine and Reaction Turbine are used based on the requirement. It is the circular guide mechanism, which guides the water to flow at designed direction. This also regulates the flow rate. A conical needle or spear operates inside the nozzle in an axial direction. This spear controls the quantity of water flowing through the nozzle. The area of the jet is reduced by pushing the spear forward inside the nozzle. Hence this results in a reduction of water quantity flowing through the jet. Similarly, if the spear is pushed back, the greater quantity of water is flowing through the jet. Spear is controlled by automatic governing mechanism or by hand depending upon the need. Some additional nozzles, known as Bypass Nozzles are provided. This way we avoid the bursting of pipe in case of sudden closing of water supply. Bypass nozzle doesn’t allow water to strike the buckets. In some Pelton Wheel Engineering defectors are provided in a nozzle, which is used to deflect the water jet. Hence preventing it from striking the buckets. The runner of a Pelton Wheel consists of a circular disc fixed to a horizontal shaft. On the periphery of the runner, a number of buckets in hemispherical or bowl shape will be fixed uniformly. The surface of buckets is made very smooth to avoid friction losses. The material of bucket for low water head is Cast Iron. For a high head, they are made from bronze, Stainless Steel or another alloy. Special Alloys are used to manufacture buckets when water is chemically impure. The buckets are generally bolted on runner disc. So, when few buckets are worn and need a replacement that can be done. The casing is, generally, made of cast or fabricated parts, to safeguard the runner and bucket assembly against accident. And also to prevent the splashing of water and lead the water to the tailrace. The casing of Pelton Wheel does not perform any hydraulic function. To reduce the speed of the runner, breaking jet is work as a break. These are very small nozzles in order to bring runner to rest in short time period. Braking jet works on the back side of buckets. This jet brought the turbine to rest for necessary action to do by engineering dept.